We specialise in baking sourdough bread, handmade using simple ingredients (flour, water, salt and our sourdough starters) and a slow fermentation process. Where possible our ingredients are organic, although we are not an organic certified bakery. All our flour is stoneground, retaining the wheatgerm, making our bread more nutritious and tasty. Everything we bake is exclusively raised with our sourdough starters too - slow bread is good bread in our book. We use Felin Ganol Mill in Llanrhystud for our Welsh white flour, as well as organic wholemeal flour, rye flour, rye chops, bran, and semolina. We use FWP Matthews Mill in the Cotswolds for stoneground organic white flour. We are learning to grow heritage varieties of grain and ingredients on a small scale for our business. We are also members of the Real Bread Campaign, and do not use any 'processing aids' or other artificial additives. We currently bake from our home near Machynlleth in a Rofco B40 oven, and hope to build a dedicated bakehouse and wood-fired oven in the future. Packed full of flavour for satisfying sandwiches and incredible toast. From first feeding our starter to baking the finished loaf it’s approximately 24 hours in the making. 70% stoneground organic white flour, 30% wholemeal flour grown and milled in Wales. Full of toasted walnuts. Made with the same dough as the Mach Sourdough. This loaf is perfect with cheese, sweet preserves and nut butters, and toasted with ricotta and a drizzle of honey. Tasty sourdough with fresh and crunchy walnuts thrown in. A beautifully soft and nutty loaf, batch-baked in an oak frame. Spelt is an ancient relative of wheat that is lower in gluten. We use our rye sourdough starter to kick-start this special loaf, adding only spelt flour, water, salt, and time. A great loaf for sandwiches and toast with it’s large square slices and soft texture. A sensory sensation with every bite. Packed full of flavour and texture. The seeds are toasted and hydrated before being added to the dough. Makes the best toast you’ll ever have! Made with organic Greek Kalamon olives, this loaf is great served on the side with Mediterranean food, and plenty of olive oil to dip it in. This German heritage loaf is a labour of love. We mature the rye sourdough starter and soak chopped whole rye grains and sunflower seeds in water and a dash of molasses for 18 hours - before even making the dough.Slice very thinly and enjoy with cheese, smoked meats and fish. A beautifully white and 100% Welsh loaf. 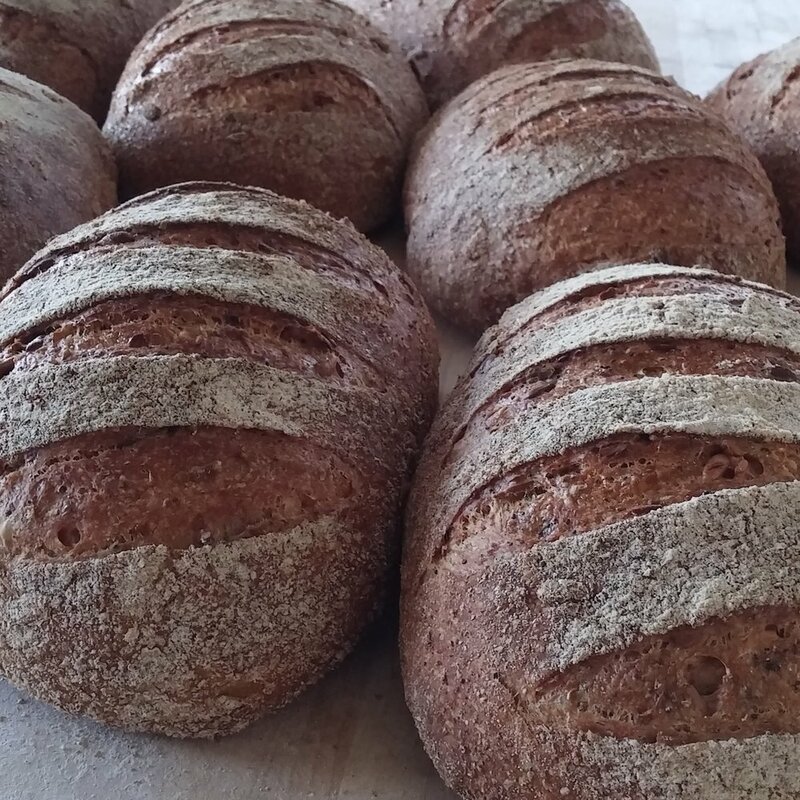 Using grain grown in Powys, stone milled and sieved in Ceredigion, and baked at our bakery near Machynlleth. Soft and light inside with a caramelised top crust, baked in a tin. We would like to say a big thank you to Maggie and Rick of Mair’s Bakehouse, who kindly passed on their stall at Machynlleth Market to us, as they move gently into retirement. They worked tirelessly for nine years to bring wood-fired sourdough bread to Machynlleth and we wish them all the best for their future.